When I first heard about sensory play, I loved the idea! It allows a child to explore their world at home (and get a little or a lot messy in the process) It has many benefits and plays an important role in child development. It allows all children to explore their world with all of their senses, sight, smell, hearing, touch, and taste. It boosts language skills, stimulates developement and helps children who have autism or are on the spectrum and children with sensory integration dysfunction disorder. Many of you have already seen the sand and water tables sold at the big box stores in the summertime. This is a similar concept. 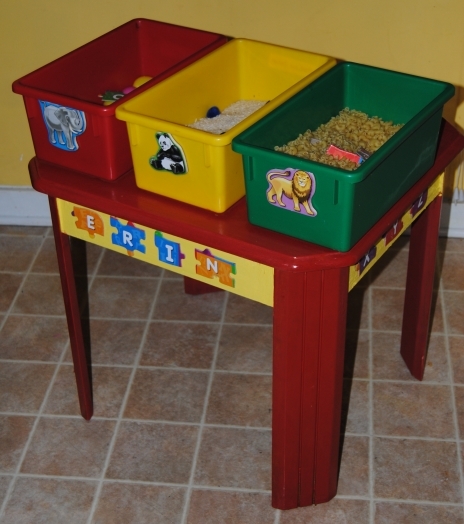 These outdoor sensory play tables are easy to recreate indoors from items found in your home. I had seen a few home-made versions of play tables on the web and thought my 33 month old daughter would love playing with one. I had tried a simple plastic bin on the floor, but it became too messy. I had to come up with a better solution. I had an old end table in our attic that we hadn’t used in years. 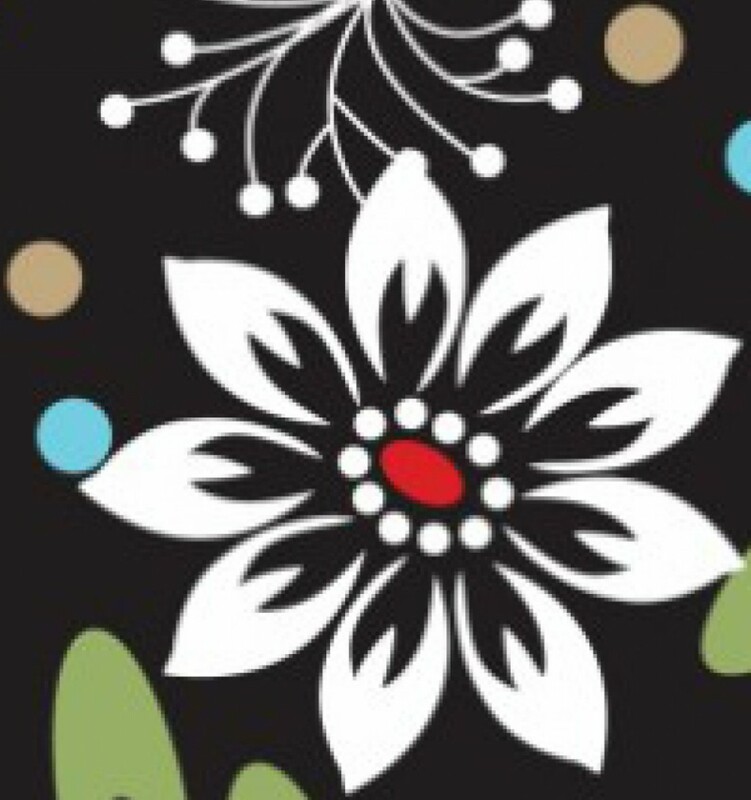 I thought this would make a great foundation for this project. 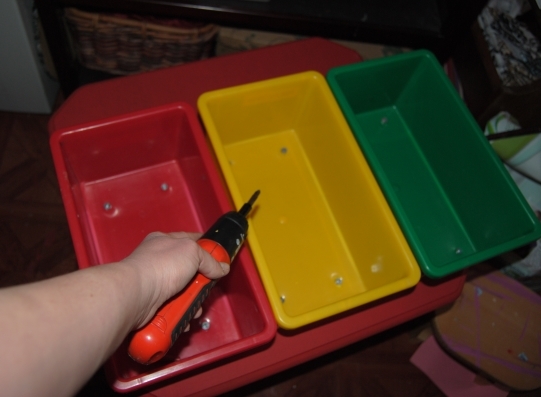 I found three great red, yellow and green plastic bins at a thrift store, that would hold various sensory play materials. You can use rice, sand, elbow macaroni and so much more in these plastic tubs. Just remember to be mindful of your child’s age and whether certain materials may pose a choking risk. First, I painted the entire table. 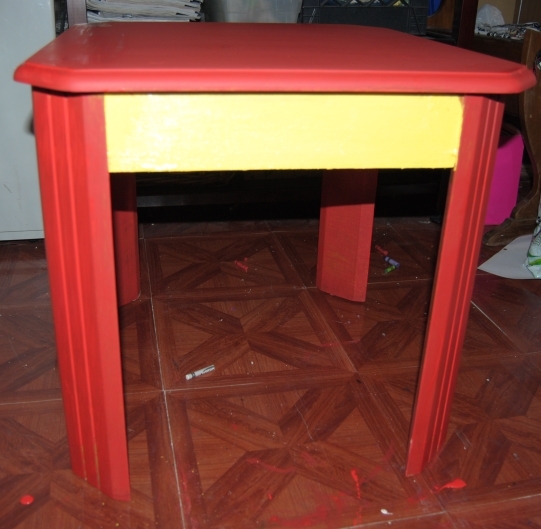 I used red acrylic paint and covered the table tops and legs. I allowed it to dry between coats. Full coverage was a total of three coats of paint. 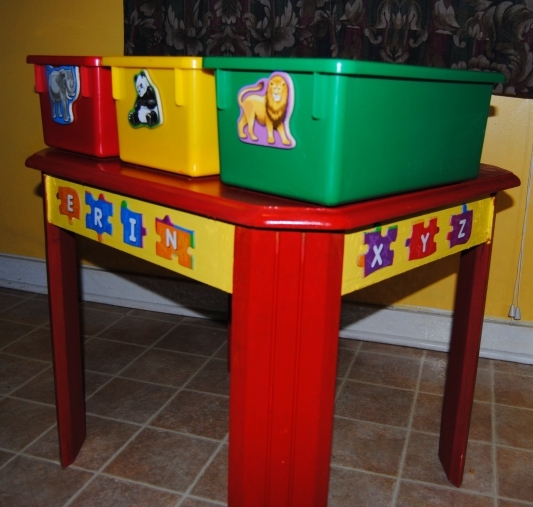 Once the table was completely dry, I used Mod Podge for the initial seal and a layer of polyurethane to protect the table if it were to get wet during messier types of play. I cleaned the plastic bins with soapy water and used a total of 12 Phillips head screws (4 per bin) and an electric screwdriver to anchor the bins to the table. It was important for the contents of the bins to stay in the bins (mostly) and this would also not allow them to tip over. I had an alphabet puzzle and animal magnets lying around the house. I thought these would add a fun element the to project while encouraging letter recognition. I decided to spell out my daughter’s name on the front of the table and for the sides place the alphabet puzzle pieces on either side of the table: ABC,XYZ. The animal magnets I placed on the front of the bins. 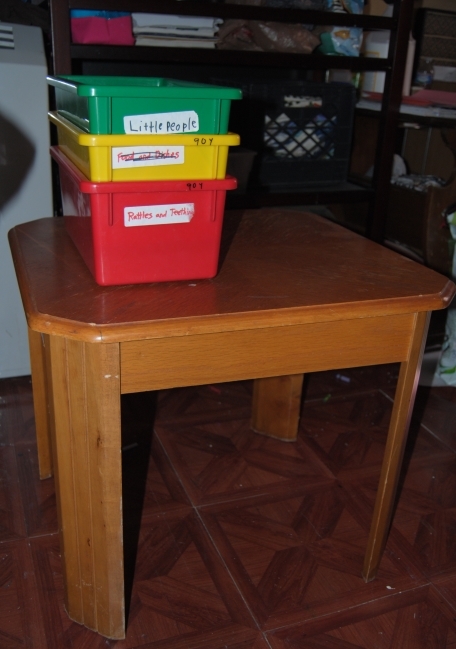 I used a hot temp glue gun to permanently adhere them to the table and the bins. great to also include shovels and cups. 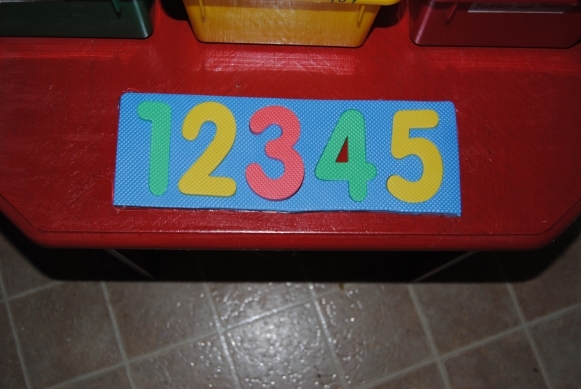 I also picked up a foam number puzzle. I had space on the back of the table, so I hot glued the puzzle sans the pieces to the table for additional educational play. I dumped the items in the pins and hid the coins, letters and poms in the macaroni and the rice. This also helps a child’s fine motor skills. The plastic eggs went in a separate bin. 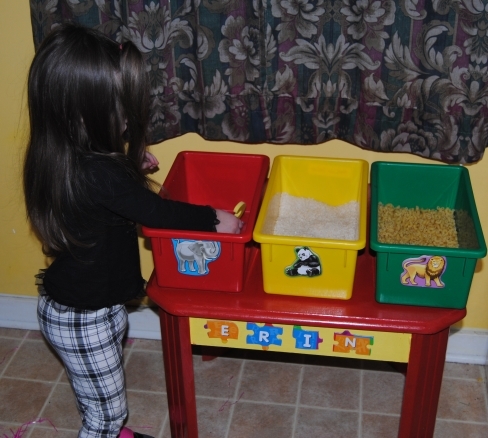 The play table was now ready for a curious 2 1/2 year-old girl to explore her senses. She loved it and it kept her attention for a long time! She loved digging and pulling out the coins and letters and running the rice through her fingers. You can create themed bins, and change materials as much as you like. Check out a few more ideas for DIY sensory tables. Great idea, and if you had someone handy with a jigsaw you could even cut out a hole so that the bin sat inside the table. ( could only fit one or two this way, I guess) but better for kids who are not that tall. Fantastic post! yes absolutely! luckily our daughter is on the taller side so this is not a factor. Mommy using a jigsaw could be dangerous LOL thanks for stopping by and commenting! This is a great idea! So creative!